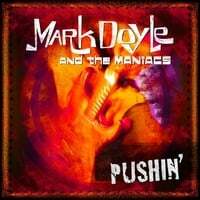 Mark Doyle and The Maniacs return for their third album of Premium Blues Rock! blues experience by touring with Freddie King, Leon Russell, Z.Z. Top, and The Allman Brothers. in magazines like Vintage Guitar in the States and Blues Matters in England. After two albums that paid homage to the British Blues Boom of the Sixties, and specifically Doyle's heroes Eric Clapton, Jeff Beck, Peter Green and Kim Simmonds, the release of "Pushin'" shows The Maniacs standing on their own feet with a bluesy, rockin' and (dare we say it) mature release of mostly original music. Included along with the six brand new Doyle originals is a stunning version of Jukin' Bone's "Nightcrawler", a turbo-charged version of Freddie King's "Palace of the King" and a final tip of the hat to British Blues godfather John Mayall with "I'm Your Witchdoctor." The current touring and recording lineup is Mark Doyle - guitar and vocals; Frank DeFonda - drums; Joel Kane - guitar, bass and vocals; and Phil Broikos - bass, keyboards, guitar, trombone, harmonica and vocals. Pushin' is a appropiate title with Mark Doyle setting the bar high with six original tunes that really showcase his creative and arranging skills into a great studio effort. A jazzy / bluesy trbute to Ronnie Earl might be the highlight of this album, with the Maniacs venturing into some new directions. Nightcrawler gets a reworked version here with a swampy type feel and female backup giving it a gospel feel. Gypsy Rider showing Mark's gifted piano talents. A Maniacs album would not be without their salute to the Brtish Blues and Witch Doctor and Palace of the King has the band in full glory staying faithful to the original version but also adding the Maniacs style. Mark's guitar playing is better than ever and it shows on this. And all driven by Frank DeFonda. Some great rockers, blues and Pete McMahon on harp make this their best effort yet. I would preface these words by noting that I've known Mark for many years and have seen his career flourish and expand but this is where he's the best, an amazing blues/rock guitarist. Doing my very best to be objective, this latest effort is beyond anything he has ever done before. His virtuosity on guitar is well known and he only gets better as time goes on. Now the cd: I will mention that I love all the tunes, the arranging and the musicianship, but here's a couple that I truly enjoyed. Trials and Tribulations a wonderful composition, arrangement, the drum break and the guitar solo intense.! Loves Curse is sweet, melodic with great licks and the organ at the end really caught my attention along with the nice fade. Night Crawler's arrangement and feel really captured the ambiance of the title.... the backup vocals were made for this tune and fit like a glove. Pushin' from top to bottom...from the first minute to the last was exceptionally well done, wonderfully mixed, engineered and produced. My congratulations to Mark and Frank and all the musicians who contributed to this great cd! From the first notes on Pushin', it's clear that Mark Doyle and the Maniacs mean business--again. Raw and wild yet completely in control, taking you with them at every step and not letting go. As much as I love MD&M's previous CDs, this one is undeniably their best yet. Blazing guitars, masterful drums, exquisite rhythms, and backing vocals that alone will blow you away. New songs that are so fresh, but with the juicy feel of having been around forever, lost in some deep archive. "Blues for Ronnie" is just pure cool, smooth and tasty, "Love's Curse" is downright mood-inducing. Have fun trying to pick just one favorite track here (and with the band's awesome YouTube videos)--Pushin' is a keeper.